The church of the Holy Archangels Peter and Paul. 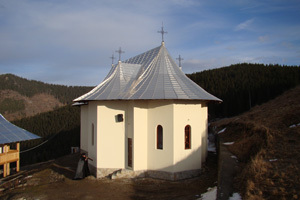 Located about 25 km away from the town of Vatra Dornei, in the green and history full mountains of Ciocaneşti, in Botos village from Suceava county, a beautiful place of prayer dedicated to The Holy Apostles Peter and Paul rests in an oasis of peace of mind and soul. The beginnings of this monastic settlement isn’t lost in the mists of history, as happens with other monasteries from Suceava County. The hermitage from Botos has risen from the zeal for God and the courage of 37 monks, who struggled during the dangerous times of the communist oppression. In the year 1959, following the 410 Decree Law, they were arrested and descended from the Botos Mountains in chains. The Monastery of the Holy Apostles Peter and Paul – general view. The domain of the monastery, measuring 5 hectares was donated by Ciocan T. Petru together with his sons Petrica and Mariana. The building and the endowment of the monastery were funded by the mayor Gheorghe Tomoiaga, his wife Irina and the sons (Pr. Dimitrie and Ioana-Maria), helped by the Archimandrite Dosoftei, and the brothers Silvia Scheul and Vladimir Tomoioaga, between 1999-2007. The first chapel, consecrated in 2000, was burned to ashes, the present church being built-up in its place. The sanctification service was fulfilled by the His Grace Pimen, Archbishop of Suceava and Radauti, together with a synod of priests and deacons. The church was built in wood. The church was built in wood by a team led by Strajeru Ilie from Pojorata, and the paintings are made by Viorel Costin from Botosani. Before its consecration there has an access road was built as well as the bell tower of the church, some trapezes, the kitchen and a tent of sanctums. 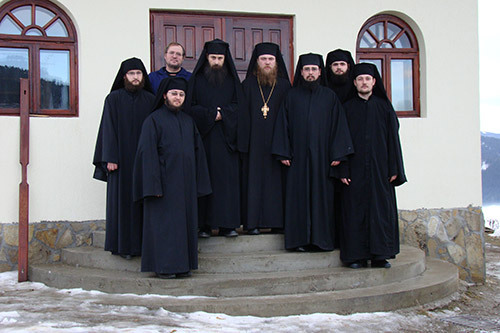 Since November 2009, having the benediction of the His Grace Pimen, a group of monks from Doroteia monastery has been transferred to Botos, with Protos as superior abbot. Thus, the array of the High Mass, of the nightly religious service and of the monastic practices was finally resumed. Up to now the building works of the sanctums have been finalized, and so have the trapezes, the kitchen and some sanctums for the pilgrims. 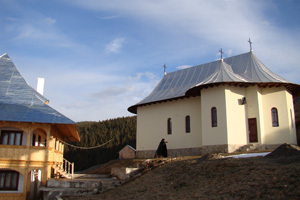 The eagerness of the believers managed to speed up the electric power alimentation of the little monastery, its decoration with adornments and new Holy Vessels. The painting of the iconostasis in Byzantine style has also begun. Inside The Monastery of the Holy Apostles Peter and Paul. In the future, with the benevolence and blessing of the bishop, a little asperses dish for the summer religious church services will be built, the water supply system will be improved and some trapezes for pilgrims will be raised. The community counts today nine members to be ordained. Thus, the daily 7 praises, the Divine Liturgy, the weekly confession of the community and the loving accomplishment of the required listening as well as the reading of the Philocalia and the patristic works are done. Those who wanted to deepen theological studies were given access to one of the faculties of theology in the country. The Monastery of the Holy Apostles Peter and Paul. The holy place of the hermitage cannot take pride in miracle-working icons, old princely treasures or heritage objects. 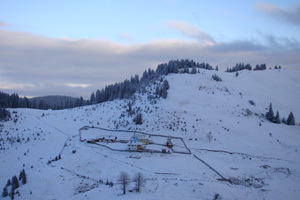 However, just as Putna, Moldovita, Rarău and Doroteia monasteries, the hermitage from Botoş takes pride in the zeal for the spiritual, in the power of the Holy Spirit earned through hard work of Divine Liturgy – the sublime essence of Christian culture and the divine gift through which Jesus Christ, our Saviour, gives himself to us, the children of the church, to eat and drink for our salvation. At 8 o’clock – the Akathist of the day, The Third Hour, The Fourth Hour, the Divine Liturgy and the memorial service for founders and the asleep ones. The gates of the hermitage are always open for all those who want to find a prayer of blessing, a prayer of absolution of sins, a prayer for health by the power of the Holy Unction, a piece of advice and spiritual rest in a special natural setting. Access: European Road Campulung-Vatra Dornei, turning right on Route 18 in Iacobeni towards Ciocăneşti/Baia Mare up to Botoş village from where the road takes you over Bistriţa river and goes upwards 3 more kilometers. 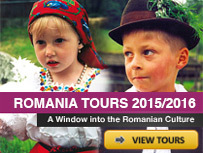 Contact: Ieromonah. Mina: 0725.278.298 and Starel Galaction: 0741.510.165.